New Delhi, Nov 18: Hours after slight improvement in the air quality of Delhi-NCR, the national capital again started inhaling toxins as the quality of air deteriorated from "poor" in the morning to "very poor" in the evening on Saturday. The major pollutant, PM2.5, or particles with diameter less than 2.5 micro metre, was recorded above 300 units. The Central Pollution Control Board (CPCB) on Saturday recorded the Air Quality Index (AQI) of Delhi-NCR at 301 and Delhi recorded 308 at 7 p.m.
PM2.5 across Delhi and NCR was above 300 units throughout the day -- at least 12 times beyond the safe limit. On Saturday evening, Ghaziabad was most polluted in NCR with the city recording 370 units, Gurgaon recorded 325 units. While Noida recorded 363 units, Faridabad recorded 315 units. Mahesh Palawat, Director of Skymet, a private weather forecast agency, said due to rain, dust particles had settled in the morning. "However, by evening, there was a fall in temperature and the wind speed was low, hence the particles got condensed and there was a drop in the air quality." He added Delhi may again witness drizzling on Saturday tonight and the pollution level could go down. According to SAFAR (System of Air Quality and Weather Forecasting and Research), an app instituted by the Ministry of Earth Science, Delhi's air quality on Saturday evening was "very poor" and is expected to remain "very poor" for next three days. Of 10 monitoring stations of SAFAR spread across Delhi-NCR, 7 recorded very poor air quality with Mathura road in south Delhi and IGI T-3 recording the worst PM2.5 concentration -- at least 320 units. Earlier in the morning, notably, most of the 17 monitoring stations of the CPCB in Delhi found air quality on Saturday in the "poor" bracket. In neighbouring Noida, Ghaziabad and Gurugram, the AQI also showed "poor" category. Experts said the rain in the national capital on Friday night and early Saturday morning was responsible for the improvement in air quality. Palawat said air quality had improved due to overnight rain, wind from the northwest and cyclonic formation in Rajasthan. "The western disturbance has moved away from hills and hill states that have witnessed rainfall and snowfall. So winds from northwest with speed of upto 15 kmph are bringing pollution levels down. The situation will be better day-by-day," Palawat said in the morning. He said rains always had a washout effect on particulate matter. SAFAR records 24-hour rolling averages of PM10 and PM2.5 and uses this data to estimate the AQI. 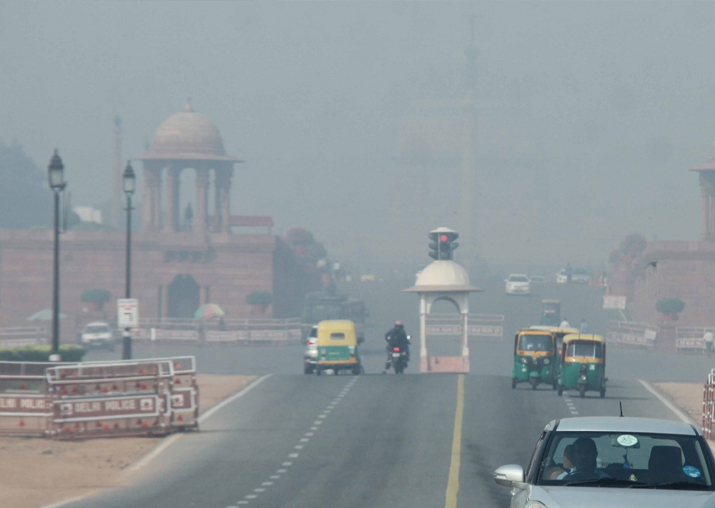 PM10 and PM2.5 are ultra-fine particles that are the dominant pollutants in Delhi. The acceptable levels of PM10 and PM 2.5 are 100µg/m3 and 60µg/m3 respectively. The larger particulate matter, measured by PM10, docked at 199 µg/m3 in the morning while PM2.5, which measures very poor and more dangerous particulate matter, hovered around 130 µg/m3. An official of the India Meteorological Department said the city recorded one mm rainfall in the 24 hours till 8.30 a.m. on Saturday. The Safdarjung observatory recorded 1 mm rainfall, Palam 0.4 mm, Lodi Road 0.2 mm, Ayanagar 0.3 mm and Ridge 0.4 mm.